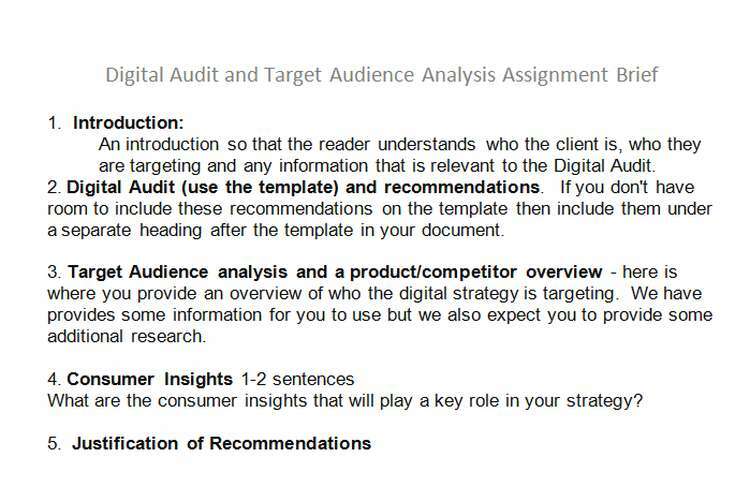 This digital audit and target audience analysis assignment brief is explore on digital audit, digital media and product overview. 1. Introduction: An introduction so that the reader understands who the client is, who they are targeting and any information that is relevant to the Digital Audit. 2. Digital Audit (use the template) and recommendations: If you don't have room to include these recommendations on the template then include them under a separate heading after the template in your document. 3. Target Audience analysis and a product/competitor overview: here is where you provide an overview of who the digital strategy is targeting. We have provides some information for you to use but we also expect you to provide some additional research. What are the consumer insights that will play a key role in your strategy? Have you justified your recommendations? Have you included academic and industry resources? Client background: The client is a family owned small business strategy. The gym has been established in the area for over 20 years with the current ownership group taking over a little over 12 months ago. The current ownership group have made considerable investments to improve the club facilities. Product Background: The club is a medium sized gym facility offering a number of different services. This includes a class timetable with 55+ classes per week incorporating Hot Yoga, Pilates, Standard Yoga, RPM (Cycle) Classes, Les Mills (Group Classes). Additionally, the facility has a sauna, pool, squash courts and spacious (600m2) gym floor area with a huge amount of equipment. The club also offers a number of PT and additional wellbeing programs such as small group training and 10 Week Challenges. Objectives (why are they online): The club currently makes use of a website and Facebook profile which is moderately active. The main objective of the website is to encourage prospective clients to visit the club and trial the services that are on offer. The Facebook Page is also designed to give prospective members a taste of what is on offer but is further, perhaps more so, used to communicate with current members, advertise joint venture partnerships and encourage current members to opt in to the additional services offered by the club. Creative considerations: The club is rebranding and will be known as Active Life Fitness Everton Hills. A Style guide has been supplied. Special requests: Viability of opening an Instagram account in conjunction with the current Facebook and Website presence. Ideas and targeting for Facebook Advertising.